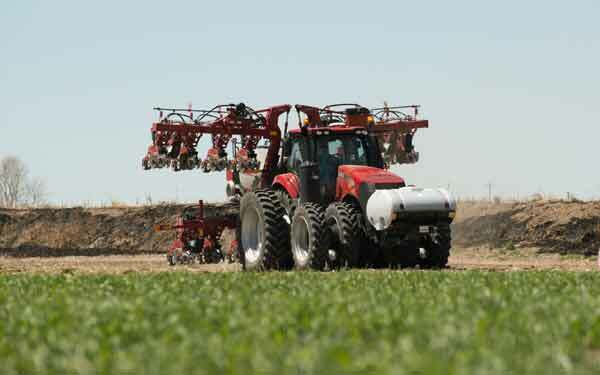 Case IH is expanding the 2000 series Early Riser planter lineup with a new 2130 stack-fold mounted 3-point hitch model. Available in five configurations, this new planter is rebuilt from the ground up, from the rugged row unit to Precision Planting technology, and includes new features that enhance productivity for high-tech strip-till and flood irrigation operations and for specialty crops, such as cotton, peanuts and dry edible beans. Available models include 12-row 30-, 36-, 38- or 40-inch row spacing configurations and 16-row 30-inch row spacing configurations. •	Irrigation — The stack-fold configuration brings row units close to the tractor, so an operator can easily maneuver and plant as close as possible to an irrigation ditch or pipe. •	Strip-till — The mounted design eliminates draft so the planter follows the tractor and, in turn, more precisely follows guidance lines. •	Wide rows — 30-, 36-, 38- and 40-inch row configurations offer options for wide rows of specialty crops. •	Multiple crop types — An improved metering system gently handles each seed, providing reliable seed delivery for a variety of crops, including cotton, peanuts, soybeans and edible dry beans.